What do I do with all the papers that come home from school? Cute little drawings, colored pictures, craft projects, stories and artwork tend to follow children home and if we’re not careful, takeover every surface. When you think about tossing them in the trash a twinge of guilt pulls at your emotions. The horrible truth is, next month the same thing happens. Weeks go by with more works of art making the stack higher, months come and go and the even when you resolve to do it, the courage subsides and less than 1/2 of the stack makes it into the bin. Is there an answer to this cluttery problem? First off: remember that what you do with that stack of artwork has nothing to do with who you care for and value your child. Now, to solve the issue takes time, it takes a change in the way you receive the items, how you display them and talk about them. Most of us parents get such a large amount of these images, we become dismissive about it. When Henry bring yet another image of a quickly scribbled heart and says “it’s for you!” it’s very easy to respond with “Oh, thanks. That’s really nice. Will you put it on the fridge for me?” and then everyone moves on. Instead, that child is reaching out, longing for a connection to you. They don’t necessarily care about the picture. They want to make you smile, they want to be noticed and they want to express that they care for you. Get into the habit of pausing, looking at your child, smiling into their face and thanking them for taking the time to create something for you. Hug them, kiss them and tell them you love them. When that moment is over, you don’t have to keep that picture. The purpose of the picture was just fulfilled: a connection between the adult and the child. 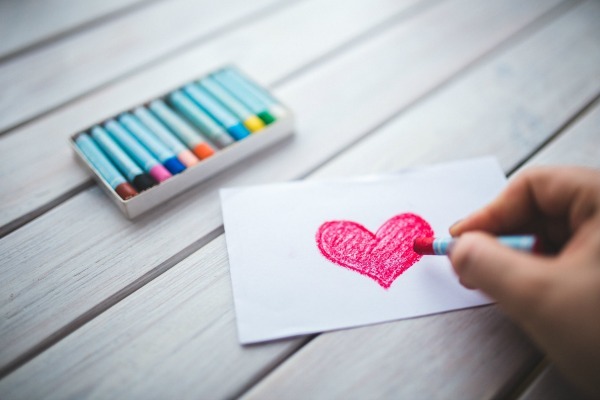 When you get into the habit of interacting in this way, you can know that your child feels valued by you by the way you interact with them, it has very little to do with the way you interact with their drawings. I know it’s busy when the kids get done with school: everyone is talking at once, showing you everything they have in their backpack, talking about recess and what happened in music class. To change your routine, ask that the kids talk one at a time, have each child get things out of their backpack and take time to listen to them about their day. 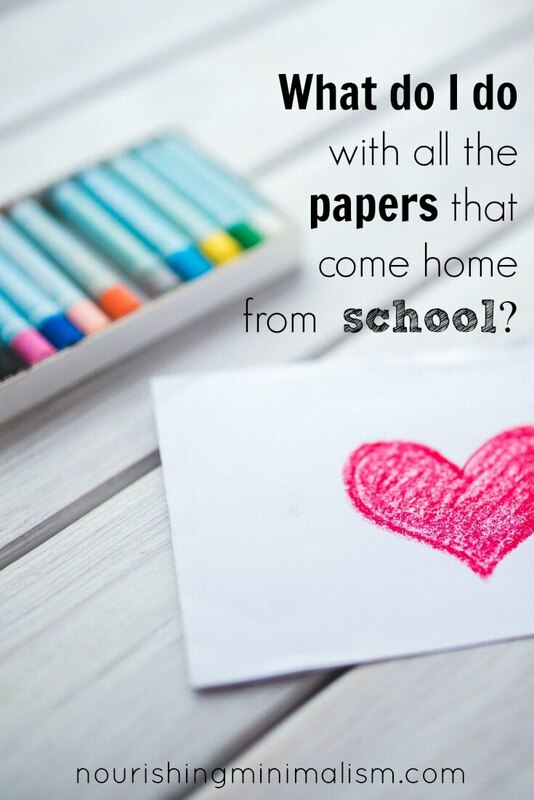 Ask questions about the papers that come home, read the teacher notes, encourage them. Just like receiving a drawing, your child wants to include you in their day. They want a connection with you before they run off. On the walls in our living room is set of hinged picture frames. The kids know that if they are proud of a picture and want it displayed, this is where it goes. 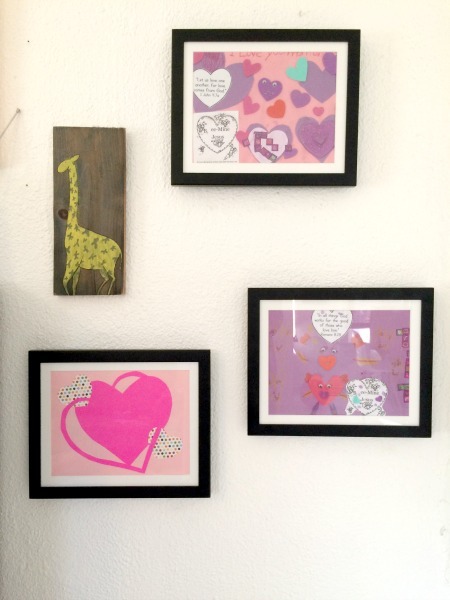 I enjoy seeing my children’s artwork on the walls and they enjoy having it displayed where everyone that comes over can see it. The hinged frames only hold so many pictures, so after a while, they have to be sorted. I have the kids sort them and toss the ones they don’t care about anymore. They are each in charge of their own frame and as long as it closes, I don’t regulate what they keep and what they discard. Most images stay up for about a month before they create something new they deem worthy to display. The kids also have tape at their disposal and if they want something hanging up in their room, I let them. We’ve used string with clothespins to hang up art, and we’ve let them tape them all over their walls. It’s their space, as long as it’s not in the way or making a mess, I don’t stress about it. If you tend to hang pictures on the fridge let them know: “We’ll enjoy this on the fridge for a week.” And when the week is over, let it go. If pictures are super special to the child, you can take a picture of them holding it (or if you have a lot, of all the pictures laid on the floor with the child next to them). This way you always have the picture, but it’s only in digital form. There are several apps that help you archive those pieces that you and your children want to enjoy. They make it easy to share with other family members, social media and print books if the need arises. Some of the stories that children write are heart-melting-ly adorable. Some people scrapbook and can fit a couple significant pieces into their children’s photo album. Or tuck the the story in the back of the book for safe keeping. If you find that you have more than a few, you can have a designated binder with clear sleeves. Limit what goes in: keep only the ones you love, put them in the binder and remember that this is for you. Don’t save it for your children. Granted, they may want to walk down memory lane sometime and look through it, but I’ve never met an adult that actually wanted to take that artwork with them when they left home. If you save it, do it for you, don’t burden your children with more stuff when they get out on their own. If you child is in love with writing stories, encourage them to write and save files in a cloud, like, google drive. You can also scan illustrations and save everything for one story in a folder to keep. Side note: Google has voice-to-text ability, so if your child wants to dictate a story: google is the place! I take pictures of the favorites works of art and writing with my mobile phone. Then compile them on Shutterfly to put them in an annual photo album for our family. It’s really a digital scrap book – including favorite photos of family life and events, with my stories to document the moments (If there’s time for that:). IT includes all all of these favorite works of art and written school work items. This way we have a book shelf of small (8×11) hard cover photo books that the kids can pull down off the shelf and look through any time to see their works of art AND our family photos all in one! Now that they’re 13 & 11… it’s really fun to look back over the years and see how they and their school work has progressed over time. At the end of my son’s kindergarten year, he was sent home with a large bag of artwork to add to the large file I had already saved. I picked favorites and made a 8×8 photobook online. I gave it to him as a kindergarten graduation present. Loved your ideas! Thank you for sharing! Pads have solved this issue! My kids each have a sketch pad and a watercolor pad and that’s it (2 and 7). Anything “Crafty” from church or bible study gets hung on the fridge for a week and then tossed in the recycling bin… i noticed that the pads have encouraged my kids to become more careful and better artists because all the pages are connected… kinda like a portfolio. appreciate reading your thoughts to help me digest where I stand but on the record, I definitely took my artwork and my stories with me when I left home and I love that my mom kept some for me. If parents dont have space or dont have the desire to have them and want to stay super minimal, there’s nothing stopping they from taking a quick photo of the work so the child can decide later if they want their artwork etc or not.